The Yankees have completed their second intra-division swap of the week, officially acquiring left-hander J.A. Happ from the Blue Jays in exchange for infielder Brandon Drury and outfield prospect Billy McKinney. Both teams have announced the swap. Happ, 35, is in the final season of a three-year, $36MM contract and is still owed $4.75MM of that sum through the end of the season. He’ll step into a Yankees rotation that currently features Luis Severino, Masahiro Tanaka, CC Sabathia and Sonny Gray. Since losing sophomore lefty Jordan Montgomery to Tommy John surgery, the Yankees have tried Domingo German, Jonathan Loaisiga and Luis Cessa in that fifth spot, but Happ will now provide a more experienced arm to step into that void. While he struggled badly in a pair of early July starts (one against the Yankees) that inflated his season-long numbers, Happ has enjoyed a strong season overall. Through 114 1/3 frames, he’s registered a 4.18 ERA with more impressive marks in FIP (3.84), xFIP (3.63) and SIERA (3.51). 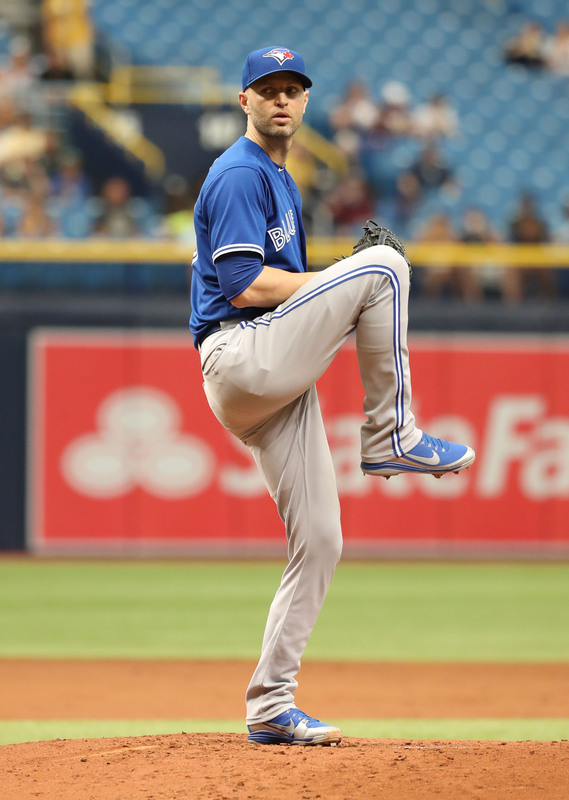 Happ has averaged a career-high 10.3 strikeouts per nine innings pitched against just 2.8 walks per nine, and he’s kept the ball on the ground at a 44.6 percent clip. He’ll be a free agent at the end of the year, making him the Yankees’ second short-term addition of the week after landing Zach Britton in yet another intra-division trade. The Blue Jays are surely thrilled to be able to pick up a controllable MLB asset in the form of Drury in exchange for a player who was set to depart via free agency at the end of the year anyhow. Drury was the Yankees’ Opening Day third baseman, but he quickly became an odd man out in the Bronx after both Miguel Andujar and Gleyber Torres emerged in the Majors while Drury was on the DL due to severe migraines and blurred vision. While Drury, 25, has batted just .176/.263/.275 in 57 plate appearances with the Yankees in 2018, he’d previously established himself as a solid producer with the Diamondbacks from 2016-17. In that time, Drury batted a combined .273/.323/.453 with 29 homers, 68 doubles and three triples over the life of 979 PAs. He’s capable of handling both second base and third base, so with Josh Donaldson set to hit free agency this winter plus Devon Travis’ perennial injury troubles, Drury is all the more appealing to the Toronto organization. The Jays can control Drury through the 2021 season. The inclusion of McKinney in the deal will somewhat incredibly mark the third trade since being selected in the first round (No. 24 overall) of the 2013 draft. The A’s selected McKinney out Plano West Senior High School and traded him just over a year later in the deal that sent Addison Russell to the Cubs in exchange for Jeff Samardzija and Jason Hammel. McKinney was moved once again in 2016 when the Cubs included him as part of the four-player package that netted them Aroldis Chapman (with the aforementioned Torres as the deal’s headliner). McKinney, 23, made his MLB debut earlier this season and went 1-for-4 before being sent back down to the minors after appearing in two games. He’s hit for plenty of power in Triple-A this season (.273 ISO), but he’s also struggled to get on base. Through 228 PAs, he’s slashing .230/.294/.502 with 13 homers, eight doubles and five triples. McKinney isn’t regarded as the top-tier prospect he once was, but he entered the season ranked as the Yankees’ No. 20 prospect by Jim Callis and Jonathan Mayo of MLB.com, receiving average grades for his power, speed and glove. He played center early on in his career but has been utilized more in the outfield corners recently. Jon Morosi of MLB.com reported that an agreement was in place (via Twitter). Joel Sherman of the New York Post (Twitter links) and Jon Heyman of Fancred (Twitter link) had previously indicated that a deal was nearing its completion. MLB.com’s Mark Feinsand reported that both Drury and McKinney were in the deal (Twitter link), and ESPN’s Jerry Crasnick tweeted that the swap had become official shortly before the clubs announced the deal. Another day, another injury for the Yankees’ outfield. Billy McKinney is headed to the disabled list after crashing into the left field wall at Toronto’s Rogers Centre on an attempted catch Saturday, Joel Sherman of the New York Post was among those to report. The Yankees will recall third baseman Miguel Andujar to take McKinney’s spot on their 25-man roster. The rookie McKinney suffered an AC sprain in his left shoulder, per Bryan Hoch of MLB.com, which forced him to leave the Yankees’ 5-3 loss to the Blue Jays in the first inning. The Yankees then subbed in Brett Gardner, who had been scheduled for an off day, to take McKinney’s place in left. Gardner joined Aaron Judge in center (his first big league game at the position) and Giancarlo Stanton in right to comprise New York’s outfield. With Jacoby Ellsbury, Aaron Hicks and Clint Frazier also on the DL, the Yankees’ vaunted outfield has taken a beating early this season. They still have the enviable Judge-Stanton-Gardner trio intact, of course, but the depth behind them is now lacking. Potential backups on the big league roster include third baseman Brandon Drury, who played 94 games in the Diamondbacks’ outfield in 2016, utilityman Tyler Wade and first baseman Tyler Austin – both of whom bring some outfield experience to the table. The Yankees also have veteran Shane Robinson in the organization, but he’s not on their 40-man roster. Andujar, 23, may slot in at both third and first in his second major league call-up. He vied for the Yankees’ third base job during the spring, but the late-February acquisition of Drury made it unlikely he’d open the season in the majors. Andujar appeared in five of the team’s games last year, which he mostly spent at the Triple-A level. He slashed an outstanding .317/.364/.502 in 250 PAs at the minors’ highest level in 2017, leading to his soaring stock as a prospect. Andujar’s a highly regarded youngster who ranks as FanGraphs’ 14th-best prospect. The Yankees announced on Friday that they’ve placed outfielder Aaron Hicks on the 10-day disabled list with a strained right intercostal muscle. 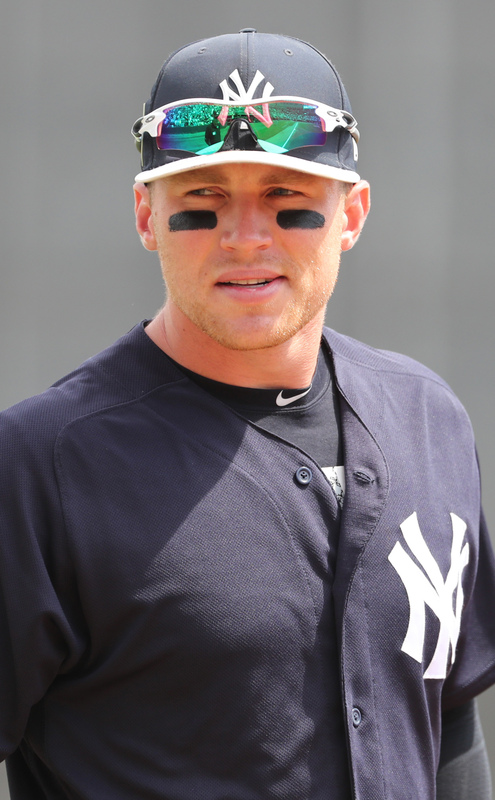 He’ll join fellow outfielders Jacoby Ellsbury (right oblique strain) and Clint Frazier (concussion) on the disabled list. Outfield prospect Billy McKinney has been recalled from Triple-A in place of Hicks. Hicks, 28, went 2-for-4 in his season debut yesterday and didn’t appear to suffer an injury over the course of the game, making today’s announcement somewhat of a surprise. The Yankees clearly have plenty of depth from which to draw, though the injuries to Frazier and Ellsbury, combined with the late-spring trade of Jake Cave, have thinned out their outfield ranks to an extent. With Hicks on the shelf, the Yankees can use Brett Gardner in center and play Aaron Judge and Giancarlo Stanton in the corners. New York is counting on Hicks for a strong performance in 2018 after breaking out in an injury-shortened 2017 season. Last year, the switch-hitting former first-rounder slashed a hefty .266/.372/.475 with 15 homers and 10 steals in 361 plate appearances over the life of 88 games. Oblique strains on both his right and left sides hampered him, but he nonetheless demonstrated enough for the Yankees to consider him their primary center fielder heading into 2018. McKinney will join the team in Toronto and make his big league debut if and when he gets into a game. The former first-round pick came to the Yankees alongside Gleyber Torres in the trade that sent Aroldis Chapman to the Cubs at the 2016 non-waiver deadline. Now 23 years of age, McKinney restored some of the prospect status he lost in a poor 2016 season by hitting .277/.338/.483 in the upper minors last season. He has experience at all three outfield spots but has spent more time in the corners recently in addition to getting his feet wet at first base in 2017. Whatever the Red Sox may prefer, the odds are that the organization will again go over the luxury tax line in 2018, Alex Speier of the Boston Globe explains. Indeed, with a hefty arbitration class set to land on top of an already robust set of guaranteed contracts, the team will enter the offseason without much hope of improving unless it’s willing to exceed the $197MM luxury tax line. Of course, the club reset its luxury tax status by staying under the 2017 mark, which reduces the penalty for going back over (but would also begin a new climb upward in the escalating tax scheme). As the Red Sox continue looking into candidates for the team’s open managerial position, the team is allowing its coaches to look into their own alternatives. Well-regarded hitting coach Chili Davis is set to visit with the Padres, per Evan Drellich of NBC Sports Boston (Twitter links). San Diego parted ways with hitting coach Alan Zinter, leaving the club looking at alternatives. Of course, it’s still also possible that a new Boston manager would prefer to keep Davis or certain other members of the staff, but the staff is now free to make its own decisions at this stage. Joel Sherman of the New York Post posits a scenario in which the Yankees can obtain quite a strong rotation next year without any massive new investments. Of course, doing so would depend not only upon achieving some notable strokes of good market luck but also upon the organization getting the best versions of some pitchers that have had their ups and downs. Most interestingly, Sherman says the “general sense” is that Masahiro Tanaka will not opt out of the three years and $67MM left on his deal. While that’s hardly cheap and still carries obvious risk, it seems like an appealing price tag for a pitcher of his pedigree, given his late-season rebound. Sherman’s most optimistic version of a 2018 staff also includes Shohei Otani, whose destination is anyone’s guess at this stage. All things considered, though, the Yanks’ roation situation does seem much better than might have been anticipated entering the year, due largely to the surge of Luis Severino and emergence of Jordan Montgomery. Meanwhile, the Yankees are trying prospect Billy McKinney out at first base in the Arizona Fall League, Bill Mitchell writes for Baseball America, though he’ll also continue primarily to be an outfielder. As Mitchell notes, McKinney showed better than ever after finally reaching the Triple-A level midway through the 2017 season. The 23-year-old slashed .306/.336/.541 with ten home runs in his 224 plate appearances there, though he also walked just four percent of the time (well below his usual rate) and carried a .353 batting average on balls in play that likely reflects both good contact and some fortune. It’ll be interesting to see when and how McKinney is utilized at the MLB level, but he could factor into the team’s depth considerations for the season to come or potentially be dangled as a trade candidate. Though the Orioles will obviously need to bring in some new players if they hope for a return to contention, Roch Kubatko of MASNsports writes that the team also must receive improvements from within if it hopes to compete. Consistent production from key players was elusive in 2017, which failed to create a base of output sufficient to maintain a winning record. Even with expectations of some bounceback performances, though, the roster will surely be in need of supplementation; MLBTR’s Mark Polishuk recently broke down the possibilities. The Phillies received little-used outfielder Hyun Soo Kim in the package for Hellickson, and the 29-year-old’s playing time won’t increase with his new team, writes Matt Breen of Philly.com. “I don’t know how much time I’ll be able to get for Kim,” admitted manager Pete Mackanin. “It’s a conundrum.” With Aaron Altherr and Nick Williams flanking center fielder Odubel Herrera, the Phillies have younger options entrenched in starting roles. That’s unfortunate for Kim, who hit .302/.382/.420 in 346 plate appearances as a rookie last year. The free agent-to-be took massive steps backward this season before the trade (.232/.305/.288 in 142 tries), and he won’t have an opportunity to improve his stock in the next couple months. As MLBTR’s Steve Adams suggested Friday, including Kim and his $4.2MM salary in the trade was a money-driven decision by the teams. The Yankees made Double-A right-hander Zack Littell a healthy scratch from his start on Saturday, reports Joel Sherman of the New York Post (via Twitter). Sherman believes the move has something to do with Monday’s trade deadline, and it’s worth noting that the Yankees and A’s are deep in talks regarding Oakland right-hander Sonny Gray. Speculatively, Littell could end up in the package going to Oakland if the Yankees acquire Gray (or as part of another deal). MLB.com ranks the 21-year-old Littell as New York’s 22nd-best prospect. More from Sherman, who writes that the Yankees may trade hot-hitting Triple-A outfield prospects Billy McKinney and Jake Cave by the end of August as a way to alleviate the 40-man roster crunch they’re slated to face in the offseason. Neither player is on the Yankees’ 40-man right now, and the team is already well off in the outfield. In lieu of protecting the McKinney-Cave tandem over the winter, then, the Yankees could do what they did with outfielder Ben Gamel last year and deal one or both of them. Gamel wasn’t on the 40-man for New York when it traded him to the Mariners last Aug. 31 for a pair of pitching prospects. While Gamel’s now enjoying an excellent rookie season in Seattle, odds are that he wouldn’t have gotten the chance to shine as a major leaguer this year had he stayed in the Yankees organization. 2:37pm: The Cubs and Yankees have each formally announced the trade. Warren will join the Yankees’ Major League roster, while McKinney will head to Double-A Trenton. Torres and Crawford are each bound for Class-A Tampa. 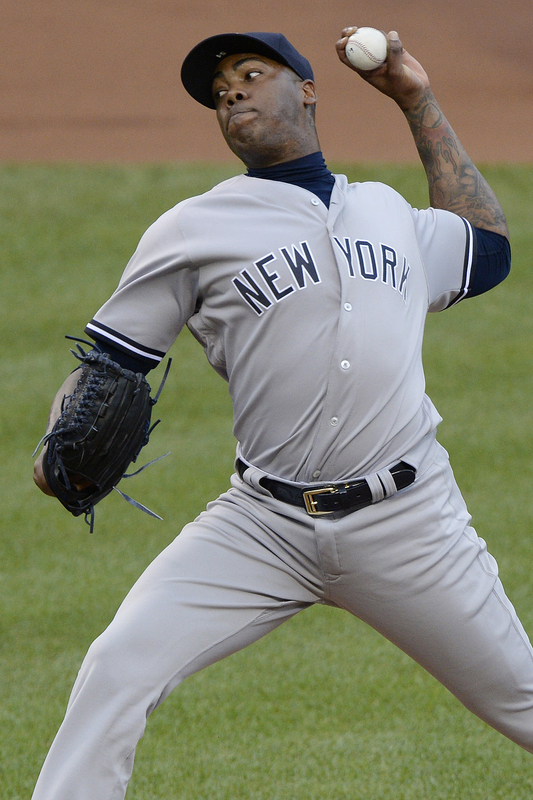 11:03am: After months of being linked to a hard-throwing left-hander for their bullpen, the Cubs have reportedly acquired the hardest-throwing pitcher in all of Major League Baseball, reaching an agreement with the Yankees that will send Aroldis Chapman from New York to Chicago in exchange for shortstop prospect Gleyber Torres, right-hander Adam Warren and minor league outfielders Billy McKinney and Rashad Crawford. The Cubs have been linked to Chapman and fellow lefty Andrew Miller for months, but the Yankees seemingly never wavered from their asking price of Kyle Schwarber in exchange for Miller, and the Cubs never budged on their refusal to discuss the injured slugger. Instead, the Cubs will pick up Chapman — long one of the best closers in all of baseball but also a free agent at season’s end, making the four-player package headlined by Torres a steep price to pay. However, the Cubs have more wins than any team in Major League Baseball and are making a clear effort to deepen their roster not just to get to the postseason but to thrive upon arriving there. The structure of the postseason schedule allows clubs to more heavily rely on their bullpen arms due to the frequency of off-days in the schedule, making Chapman that much more valuable in a five- or seven-game series. The 2016 season has seen Chapman continue his on-field excellence, posting a pristine 2.01 ERA with 12.6 K/9, a career-best 2.3 BB/9 and a 37.3 percent ground-ball rate. Chapman’s fastball has averaged a staggering 100.1 mph this season, which is a strong driving factor behind an 18.2 percent swinging-strike rate that is the fourth-highest in MLB. Since taking over as the Cincinnati closer back in 2012, Chapman has compiled a 1.91 ERA with 165 saves and a ridiculous 500-to-117 K/BB ratio in 287 innings of relief work. He’s earning $11.325MM this year and has about $4.33MM remaining on his salary through season’s end. Chapman becomes the second hard-throwing lefty to join the Cubs’ bullpen in the past week, as Chicago also picked up lefty Mike Montgomery from the Mariners in a trade that sent slugging (and blocked) minor league first baseman Dan Vogelbach to Seattle. Chapman figures to supplant Hector Rondon as the Chicago closer, pushing Pedro Strop to the seventh inning. Montgomery and right-hander Carl Edwards Jr. will mix in as well, as will right-hander Justin Grimm and veteran right-hander Joe Nathan, who was just brought to the Majors over the weekend after completing rehab from Tommy John surgery. Travis Wood has pitched to a 2.88 ERA this season and is second among Chicago relievers in terms of innings pitched, so he’s likely to become the third lefty in manager Joe Maddon’s bullpen. As such, the acquisition of Chapman could push left-hander Clayton Richard, who has a 6.43 ERA in 14 innings this year, out of the picture. Chapman’s time with the Yankees will ultimately prove to be brief in nature, as he spent just a few months in the organization and only a bit more than two months on the active roster due to a 30-game suspension under Major League Baseball’s domestic violence policy. Chapman was investigated by the league this offseason following allegations of assaulting his girlfriend at a party and later discharging a handgun in his garage, though he was never arrested nor were any charges filed. While the moral and ethical implications of acquiring a player associated with that investigation can be debated to no end, from a pure baseball perspective, the investigation drastically lowered the price for the Yankees to acquire Chapman this winter. They’ll now swap out Eric Jagielo, Rookie Davis, Caleb Cotham and Tony Renda for a significantly more talented package of talent, headlined by Torres and McKinney. Warren will return to the Bronx with two and a half years of service time, and he’ll be a familiar face for the Yankees, who just this offseason traded him to the Cubs in order to acquire Starlin Castro. However, Chicago proved to be a struggle for Warren, who pitched to a 5.91 ERA in 35 innings with the Cubs. Considering the strong work that Warren did from 2013-15 with the Yankees — 3.23 ERA, 7.7 K/9, 2.9 BB/9, 45.3 percent ground-ball rate — the extent of his struggles was fairly surprising. The primary culprits for Warren were a dramatic spike in his walk rate (4.9 BB/9) and a massive increase in homers. A fluky 16.7 percent homer-to-flyball ratio undoubtedly impacted his 1.8 HR/9 rate, but Warren’s general problems with locating his pitches actually led to a greater percentage of pitches in the strike zone, particularly when behind in the count. Torres, 19, is the most highly regarded prospect joining the Yankees’ ranks. One of the prizes of the Cubs’ pool-shattering international spending spree three summers ago, the shortstop entered the season as a consensus Top 50 prospect around the league and has only continued to boost his stock. Torres is hitting .275/.359/.433 with nine homers and 19 stolen bases in 409 plate appearances while playing against considerably older competition. ESPN’s Keith Law rated Torres 26th on his midseason list of the game’s top prospects, and Baseball America pegged him 27th. Law noted that Torres has put on weight and filled out a bit, making it less certain that he’ll stick at shortstop but adding to the power output he’s delivered in a pitcher-friendly home park as one of three teenagers receiving regular at-bats in the Carolina League this year. BA notes that he’s recovered from a dreadfully low start — indeed, he’s hitting .302/.379/.468 since May 1 — and has shown enough added pop to profile at second or third base even if he has to move off of shortstop. The 21-year-old McKinney was a Top 100 prospect entering the season but has seen his stock dip a bit, part of which BA attributes to adding “some bad weight” and slowing down both in terms of foot speed and bat speed. In 349 plate appearances at the Double-A level this season, McKinney is hitting .252/.355/.322 with just one home run. However, he’s quite young for the level and is just a year removed from hitting .300/.371/.454 as a 20-year-old between Class-A Advanced and Double-A, so there’s certainly room for a rebound. And, as evidenced by McKinney’s 47 walks (13.5 percent) against 68 strikeouts (19.4 percent), he still possesses strong discipline at the plate that should play into his favor as he continues to develop. The Yankees will be the third organization for McKinney, who was selected 24th overall by the A’s in 2013 but traded to the Cubs alongside Addison Russell in the Jeff Samardzija/Jason Hammel blockbuster back in 2014. As for Crawford, the 22-year-old was an 11th-round pick out of high school by the Cubs back in 2012 and is in his first season at Class-A Advanced. He’s hitting .255/.327/.386 with three homers and 22 steals in 28 tries through his first 370 trips to the plate. Crawford didn’t land on any top 30 lists for the Cubs, but BA’s J.J. Cooper tweets that as a toolsy center fielder with plus speed and plus defense, Crawford is the “perfect” fourth player/lottery ticket to add some further upside to the deal for the Yankees. Jon Heyman of FanRag Sports was the first to report that the two were talking about a trade involving Chapman and Torres and also the first to say a deal was in place (via Twitter). Joel Sherman of the New York Post first reported Warren’s inclusion (links to Twitter). Sahadev Sharma of TheAthletic.com first reported that McKinney was in the deal (also via Twitter). Patrick Mooney of CSN Chicago reported that Crawford was the fourth player (Twitter link). 10:13am: Outfield prospect Billy McKinney would also be going from the Cubs to the Yankees, tweets Sahadev Sharma of TheAthletic.com. 8:48am: Joel Sherman of the New York Post reports (links to Twitter) that the Cubs would send four players to the Yankees in the deal. In addition to Torres, former Yankees right-hander Adam Warren would likely return to New York. Jeimer Candelario, according to Sherman, is not in the deal. The trade has the approval of Yankees owner Hal Steinbrenner, Sherman notes. Rosenthal tweets that the trade is in its final stages, and the players have been agreed upon. JULY 25, 8:32am: Ken Rosenthal of FOX Sports tweets that if the deal is completed, there will be “much more” than just Torres and another prospect in the deal. Jorge Soler will not be included in this trade, reports Jon Morosi of MLB.com (on Twitter). JULY 24, 8:06pm: There hasn’t been any talk of a contract extension between Chapman and the Cubs, Heyman reports (Twitter link). The trade is “looking likelier” but still not finalized, Yahoo Sports’ Jeff Passan tweets. Torres is one of “multiple” Cubs pieces that have been agreed upon as part of the deal. 7:04pm: The Yankees and Cubs are working towards a trade that would send star closer Aroldis Chapman to Chicago in exchange for top shortstop prospect Gleyber Torres and more, FanRag Sports’ Jon Heyman reports via Twitter. Sports Illustrated’s Kenny Ducey reported (Twitter link) earlier tonight that Torres was scratched from the lineup for Chicago’s High-A affiliate, and SB Nation’s Chris Cotillo adds that Torres was indeed removed due to ongoing trade talks. The Chapman sweepstakes were seemingly coming to a peak earlier today when the Yankees reportedly asked the Cubs, Nationals, Indians and a mystery fourth team to submit their best final bids for Chapman’s services, with the Rangers and Dodgers also seemingly on the periphery of the market. Cleveland appeared to be in the lead since the Bombers apparently weren’t impressed by a Nats trade package headlined by pitching prospect Erick Fedde (as Joe Ross was seemingly the main piece the Yankees were seeking from Washington). Adding Torres to their offer, however, could well be what has apparently put the Cubs into the driver’s seat. The 19-year-old shortstop was hailed as one of the top minor leaguers in baseball as per preseason top-100 rankings (ESPN’s Keith Law had Torres 15th, MLB.com had him 28th, and both Baseball Prospectus and Baseball America had him 41st). Baseball America had Torres ranked as the top prospect in the Cubs’ system, no small feat given Chicago’s impressive amount of minor league depth. Signed for a $1.7MM bonus as part of the Cubs’ international signing splurge in 2013, Torres has a .275/.359/.433 slash line and nine homers in 409 plate appearances at the high-A level this season. MLB.com’s scouting report gives him plus grades in everything but power-hitting, and some scouts believe even that will eventually manifest itself in the form of 15-homer power. While he could stick at shortstop, Torres could also move to third base or second, which may be his Yankee path as a long-term replacement for Chase Headley or Starlin Castro since Didi Gregorius has blossomed as New York’s regular shortstop. With Chapman set for free agency this winter, Torres alone would’ve been quite a return for the Yankees. Torres and even more young talent is quite a heavy price for Chicago to pay, though the Cubs are one of the few teams with enough position player depth at both the major and minor league levels to afford surrendering a top prospect like Torres for a rental player. Of course, given how the bullpen is arguably the only semi-weak spot on the Cubs’ roster, adding a dominant force like Chapman may be the last piece Chicago needs to finally win another World Series. Chapman has a 2.01 ERA, 12.6 K/9 and 5.5 K/BB rate over 31 1/3 innings this season, not seeing the field until May due to a 30-game suspension under the league domestic violence policy. Hector Rondon has hardly done anything to earn a demotion given his own spectacular numbers, though the Cubs closer would move to a setup role if and when Chapman joins the fold, with Pedro Strop, Travis Wood and the newly-acquired Mike Montgomery serving to protect leads into the eighth inning. Beane first reached out to Cubs president of baseball operations Theo Epstein about a month ago because he felt there was a lot of value to striking early, especially if the A’s were going to be aggressive with their prospect package, which they clearly were. The Cubs were initially looking to split Samardzija and Hammel in different trades, but trade talks picked up steam when the A’s decided that they wanted both players. After a dormant period, things came together quickly in a matter of 24 to 36 hours, says Beane. He added that he and Epstein discussed some one for one swaps on each pitcher that obviously didn’t pan out. That Samardzija is under control through 2015 was “critical,” said Beane, noting that he’s excited about the added depth that the 2015 roster will have with Jarrod Parker and A.J. Griffin returning from injury. On what motivated him to make the trade, he offered the following: “I’ll be honest with you, I happen to think the Angels and the Mariners right behind us are two of the better teams in all of the game and they happen to sit in our division. So the narrative that this was a ’postseason move,’ I think was a bit presumptuous.” He went on to say that winning the division is Oakland’s priority and stressed the dangers of getting involved in a one-game Wild Card playoff. “If you had a one-game playoff and you’re the Wild Card, one of the guys you might be facing is that guy up in Seattle, and that’s not a good situation to be in.” Beane, of course, is referring to Mariners ace Felix Hernandez. Bowden asked if the A’s would have made this deal had Parker not gone down with Tommy John surgery in Spring Training, Beane thought out loud before concluding that he and his staff probably would not have had to make this deal had Parker been healthy. Beane offered high praise for prospect Billy McKinney but even higher praise for Addison Russell, listing him alongside Eric Chavez and Miguel Tejada as one of the best position prospects he’s ever had. The emergence of minor league shortstop Daniel Robertson, whom the A’s selected 21 picks after Russell, made it easier to part with Russell, though it was still difficult for Oakland. Asked if this was the best team he’s ever constructed, Beane said he couldn’t judge that at this point and offered praise for his assistant GMs as well. One element of which Beane is very proud is that 23 of the 25 players on the Athletics’ roster were acquired via trade — a very different method of construction from the 2001 “Moneyball” A’s.